There's been a shake up in the design ranks at Sportmax over the last few seasons, sifting a new layer of cool on its fashion runway. The collection opened with plays on leopard and python, two roaring animal prints that have seen their fair share of show time. 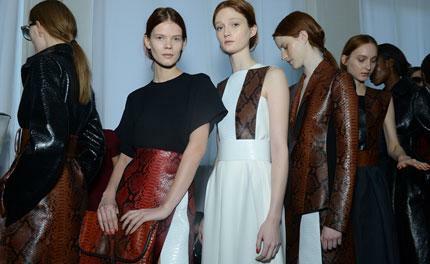 But here, cut into sturdy coats and narrow V-neck dresses, the wild graphics were tamed. The streamlined shapes were immaculate, set off by extra-long leather arm cuffs while equestrian-inspired martingales were used as thick clean belts to divide the canvas. By mid-show, Sportmax had already converted its audience with a strong outing but things only continued to bubble more vivaciously with woolly multi-coloured mohair coats, dip-dyed wool suiting and a brilliant neon jacquard, with Jackson Pollock-like squiggles and drips, that was imagined in narrow Modernist 2-piece skirt suiting.